In cooperation with Fatih Municipality and the Classical Turkish Arts Foundation and under the leadership of Turkish Presidency, the Yeditepe Biennial was introduced to press members in the Sepetçiler Pavilion with Fatih Mayor Mustafa Temir and board members of Classical Turkish Arts Foundation and the curator of the Yeditepe Biennial, Serhat Kula, on Wednesday. At the ceremony, it was announced that the opening will take place at Hagia Sophia by President Recep Tayyip Erdoğan on Saturday and the theme of the biennial is "Ehl-i Hiref," meaning "artisans" in Ottoman. At the press conference it was noted that the biennial will feature the cultural, social and artistic values and works of Turkey and that it is the first biennial for classical Turkish arts. There will be almost 3,000 works of over 600 artists along with hundreds of projects. The biennial will spread throughout almost 30 historical locations. The events at the historical locations will host participants and artwork that reflect both the past and present. The curator of the Yeditepe Biennial said the Fatih district will be contributing to the biennial with its locations but that the biennial is not just about the work produced there. There will be five different concepts at the biennial and all of them have stemmed from forms, styles, content and metaphors of the Ehl-i Hiref school of Ottoman times. National, international and personal exhibitions, seminars, panels, conferences, panel discussions, movie screenings, concerts, indoor and outdoor location installation works, workshops, commemoration programs of the experts of traditional arts, introductions and visits will be organized within the scope of the biennial. THEME OF FIRST BIENNALE: "EHL-İ HİREF"
"Hirfet" means profession, art and business and its plural "hiref" is used in Ottoman for describing art and crafts. Any kind of handicraft can be included in hiref and those producing it have been called "ehl-i hiref" (artisans/craftsman). There are five subthemes of the festival: "Çiçeğin Her Hali" (Every State of Flowers), "Kuş Misali" (Like a Bird), "İstanbul'a Dair" (About Istanbul), "Kusursuz Tekrar" (Perfect Repetition) and "Mekandan Taşanlar" (Location and Beyond). We use the phrase "like a flower" to define beauty. Therefore, flowers drawn by artists inspired by this beauty are everywhere. Our culture, which has cultivated and drawn flowers for centuries, has used them in almost every arena. Flowery adornments can be found on Qurans, chinaware, collected poem pages, pillars of mosques and gorgeous tombstones. Work created by the artists inspired by the past and tradition honoring every state of flowers will be on show at the Yeditepe Biennial. Birds are one of the animals people often wish they could turn into. We are jealous of their wings and look for ways to learn their language, talking to them despite the fact it makes us look a little crazy. Though they may not always reply, speaking to them is often better than simply talking to yourself. We build them mansions and make baths for them on our tombstones. The artists who look at humanity and its problems "like a bird" will interprete the human condition via bird language at the Yeditepe Biennial. Istanbul is Mehmed the Conqueror's city, Sinan the Architect's workshop, subject of Nedim's verses, Dede Efendi's songs, Evliya Çelebi's notebook, Eyüp Sultan's mosque and Abdulhamid Han's wordbook. A city split by a sea, where great dreams take place, Istanbul. Istanbul, for those who have seen it and those living in it has something to say about yesterday, today and tomorrow. With its southwest and northeast winds and its sea that gives color to the skies, the artists of today's Istanbul will take their place at the Yeditepe Biennial. Iranian thinker and poet Feridüddin Attar says, "Each number is made of a repetition of one." The sun rises and sets. We constantly blink. The call to prayer is repeated and repeated again. The verses are repeated meaningfully. Repeated verses, actions, repeating notes, miniatures, calligraphy and the repetition within architecture are all rhythms. Artists aware that every repetition does not increase what is being repeated but does something else, a single straight line consists of repeated dots, those who hear the song of the geometric rhythms, those who say "there is art in repetition" will be presenting their Works at the Yeditepe Biennial. This theme consists of works by artists who go beyond their bodies and souls to create their art. The artists who do not limit themselves inwardly are able to open their minds to beauty, art and artists, and their work will be presented under this subtheme. Artists, backed by traditional Turkish art, will turn the biennial into a rainbow of exhibitions comprised of personal work alongside pieces by their students and friends. 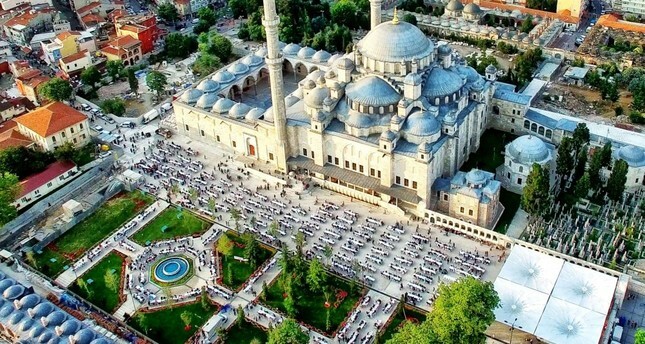 A total of 21 personal exhibitions, including miniatures, gilding, calligraphy, water marbling, ceramics, painting, sculpture and photography, will be presented in amazing locations like the Türk İslam Eserleri Museum, Sirkeci Train Station and Bayezid II Turkish Hammam Culture Museum all located on the historical peninsula of Istanbul. There will be many group exhibitions showcasing all of the colors of traditional art in contemporary forms, which will make participants question what art is and who is an artist at the biennial. Collection exhibitions will introduce the works of collectors' rare examples of traditional Turkish art rarely produced in modern times. The biennial presents works of contemporary artists along with experts that preserve traditions. When we see an artwork that speaks to us we often ask ourselves, "How did the artist create this?" The live performances included in the Yeditepe Biennial will be a chance for the visitors to witness the art process. Artists will recreate their workshops outdoors allowing visitors to observe and witness the creation of an artwork. These programs are some of the most "live" sections of the biennial. The workshops are the most interactive locations for those who want to experience something that they believe they cannot do. They bring people to the present. With art under the leadership of masters, art lovers will get the chance to work with the artists and co-create.